Basic moves, for example, push-ups, squats and planks, being performed on an unstable surface, like the stability ball, means that muscles get more attention. Stability balls can also be beneficial for getting back into shape, if you have been out of training for whatever reason. This is because they reduce muscle and spinal strain during certain movements. If you only use a stability ball for crunches or comfort to sit on, then try and enjoy a new way to adjust traditional exercises into multi-muscle movers that will benefit your body and give you satisfying results. Below is a workout compiled to give you enough to learn new techniques and feel the difference! After you complete the warm-up, perform each exercise for the recommended number of reps, back-to-back with little or no rest in between. Perform the full circuit one to three times total on up to four non-consecutive days a week for best results. You will need a set of dumbbells (five to 25 pounds, depending on your fitness level) and a stability ball. Get your body ready for the workout ahead of you with this complete body move exercise. Begin holding the ball, standing with your feet slightly wider than hip-width apart. Then lower into a small squat, tapping the ball lightly to the floor. Stand up, drawing your abs in tightly and keeping your arms extended and raise the ball overhead. Want more of a core challenge? 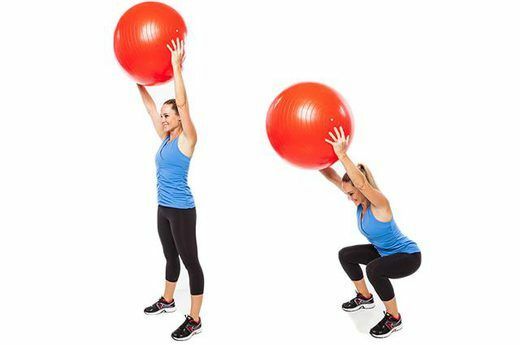 Hold the stability ball overhead the entire time. Start by standing with feet slightly wider than hip-width apart, holding the ball overhead. Lower into a deep squat, sitting back into your hips and keeping your knees behind your toes while keeping ball overhead. You can avoid straining your neck by keeping your chin pointing towards your chest. This is much more difficult than regular planks! Begin with elbows on top of the ball, lined up under your shoulders, hands clasped together, feet hip-width apart. Brace your abs and keep your chest and stomach off the ball completely. Now write your full name, first, middle and last, with your elbows on top of the ball. Make this harder by bringing feet together or easier by widening your stance. Use the ball to increase your range of motion and challenge your balance with this great back-strengthening exercise. 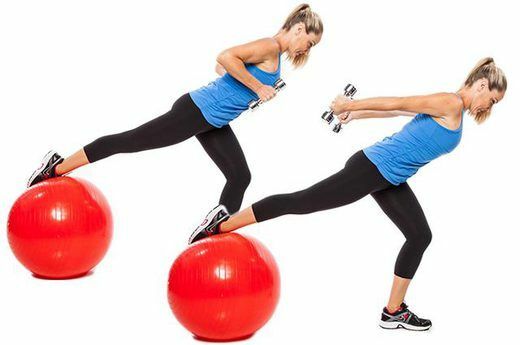 Begin balancing on the ball, with the ball positioned between your belly button and pelvis. Your legs should be extended straight back, hip-width apart. Extend your spine and lift your chest off the ball, reaching your arms into a Y position in front of you, with thumbs pointed up. Lift your rib cage off the ball, further extending your spine, as your arms reach down by your sides into an I position, squeezing your shoulder blades back and together with your thumbs still facing up. Challenge the muscles from your ankles all the way up to your hips with this rear lunge. Stand about one foot in front of the ball with your right knee bent, the top of your foot pressed into ball, holding dumbbells by your sides. Hinge forward from your hips, bending your left leg as your right leg extends back, moving the ball away from your body. Reach with the dumbbells, on either side of your left leg, toward the floor. Go as low as possible without rounding your back. 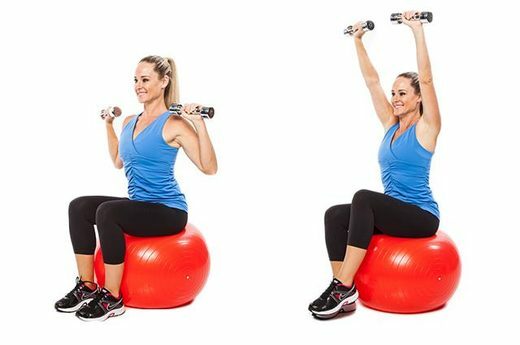 Engage your shoulders, abs and thighs by balancing on the ball during your overhead press. Sit on ball with feet hip-width apart, arms bent by your sides, holding dumbbells in front of your shoulders, palms facing front. Your arms should be slightly in front of your body at the top of extension, never behind your head, as one foot lifts off the floor. Make sure to keep your shoulders stacked over your hips. Perform 20 reps, alternating legs each time. Work your entire body with a major emphasis on the abs! Begin in a plank with the ball under your feet, shoulders lined up over your hands. Lift your hips and pulling the ball in closer to your chest. Try to raise your hips over your shoulders, if possible, and press your feet down into the ball to make it easier to slide your legs in during the pike. Too tough? Start with a small range of motion, lifting your hips only slightly until you feel ready for more. Try up to 10 reps. Turn up your triceps work with this multi-tasking move that works not only the backs of your arms, but also your legs and core! Stand about one foot in front of the ball with your right knee bent, the top of your foot pressed into ball. Bend your elbows behind your body, holding the dumbbells by your sides. Hinge your torso forward from the hips, bending your left knee about 45-degrees as your right leg extends straight back behind your hip. Extend your arms straight back behind you. Bend your elbows back in. Begin in a plank with hands pressed into the ball. Make it easier with your feet positioned wider apart or harder by bringing your feet closer together. Do a push-up by lowering your chest to the ball, bending your elbows out to the side and avoid letting your hips sag. Try to tap your chest on the ball if possible but don’t rest your body on the ball. Try up to 15 reps.
Work your inner thighs, glutes and back with this balancing exercise. Stand with your left leg extended straight to the side and your left foot pressed on top of the ball, holding a dumbbell in your right hand. Lower into a single-leg squat by bending your right knee, pushing your hips back. Hinge slightly forward from your hips, reaching your right arm toward the floor. Row your weight back by bending your right elbow in by your side, pulling the dumbbell to the side of your torso as your left knee bends, curling the ball toward your body. Extend your leg and arm back out. The backs of the legs can be tough to target, but this exercise is guaranteed to make your hamstrings work! Begin in a bridge on the ball: Lie face up with your knees bent and hip-width apart, feet flexed, heels pressed into top of the ball with your arms extended by your sides pressed into the floor and hips lifted. Engage your abs and extend your legs out straight, keeping your hips off the floor. Use your abs and arms to help stabilise your torso. Try this multi-muscle ab-strengthening move. Begin in a plank with the ball under your feet, toes pointed, abs tight and shoulders over your hands. Draw your abs in deeper and bend your knees into your chest, pulling the ball in and keeping your shoulders lined up over your hands. Press your feet down into the ball to make it easier to slide your legs in. After you’ve finished the final round of the circuit, finish your workout with some stretches. Stand with your feet wide and your arms extended out to the sides with the ball in front of you on the floor. Bend your knees and hinge forward, placing the back of your right hand on top of ball and keeping arms extended, turn your chest toward ceiling. Roll onto your right shoulder, looking up to your left hand. Then open your chest toward the ceiling the other way (the ball is between your arms on your chest side), turning toward the right, looking up to your right hand.